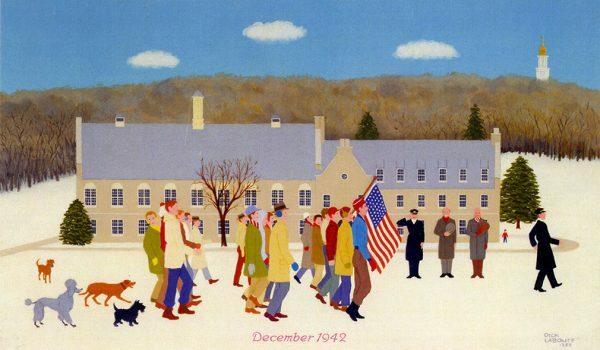 Our nation was in the midst of the Great Depression when the Class of 1943 came to Colgate. Many students were drafted in World War II, so they completed on-campus military training in addition to their studies. When they marched away in the winter of 1942, America was deep in the fight against fascism abroad. Thirteen of them died on the battlefield. The university held an early December graduation for the class before they headed off to war. Now, 75 years have passed and much has changed, but 1943’s love for Colgate, class, and country remains strong. 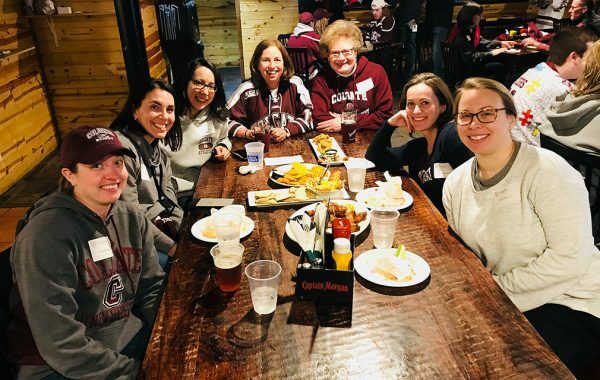 On Dec. 13, 2017, nine class members dialed in via telephone to their 75th Reunion, which included musical performances by the Colgate Thirteen, historical accounts of the 1942 wartime commencement, and remarks by President Brian W. Casey and other prominent members of the Colgate community. Cryptocurrencies are disrupting nearly every industry and revolutionizing the way companies do business. On Feb. 15, 2018, in New York City, 112 alumni gathered to discuss the emergence of digital dollars. 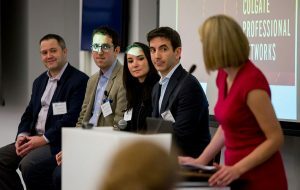 This Colgate Professional Networks event, called Bitcoin and Blockchain: What You Need to Know, offered an inside look at what cryptocurrencies mean for various industries. 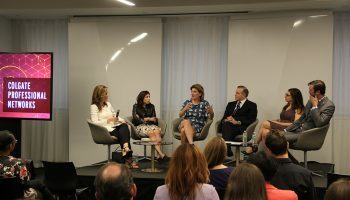 Hosted by Stuart Fischer ’72 and moderated by Abigail Doolittle ’95, the event included panelists Jason Kaplan ’06 (Blockchain for Change), Jamie Lane ’91 (Merrill Lynch), Samantha Radocchia ’11 (Chronicled), and Todd McDonald ’96 (R3). The discussion was followed by a networking reception. – Life Beyond Earth? Exoplanet Discoveries and Our Place in the Universe in Washington, D.C.
To find an upcoming event near you, visit colgate.edu/networks. In decades of working as a Paris-based correspondent and editor for BusinessWeek and the International Herald Tribune, I always hoped there would be a Colgate alumni club in the heart of Europe. After all, Princeton (my other alma mater), Harvard, and Stanford, among others, had them in Paris, and there is a widely admired, active Colgate club in London. Early last spring, thanks to a chance meeting with Tad Brown ’58 at the American Church of Paris, we were off and running. Upon contacting the alumni relations department, I learned of another Paris-based graduate, Albert Naim ’14, who guided us to a list of alumni scattered throughout France, Belgium, and Switzerland. By September, we received upbeat responses by many of the some 60 on our list. 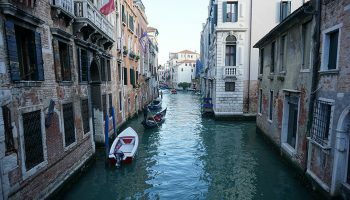 We started planning a reception for Jan. 26 with alumni and approximately 17 students from the Geneva Study group, which is being led by political science professor Bruce Rutherford. We also invited the economics and Dijon groups, headed by economics professor Chad Sparber and humanities professor John Naughton, respectively. The evening began with a talk by former journalist Sebastien Maillard, the French director of the Jacques Delors European Union Institute, on the domestic and international challenges facing the European Union and whether or not Europe could replace the United States as a global power. The students joined in the lively discussion that followed, and Professor Rutherford updated us on the latest regarding Colgate and his group, which had already met with EU leaders in Brussels and the Hague, among other stops. After some three hours of discussions between the alumni and students, we adjourned, amid calls for repeating such a meeting for all three study groups if and when they visit Paris. 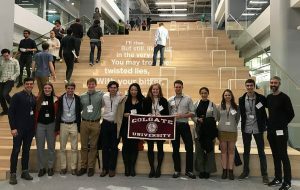 Sarah Durlofsky ’19 also followed up, saying: “I enjoyed the event and our discussion about Trump and the World Economic Forum” (which earlier in the day was marked by Trump’s address in Davos, Switzerland). Finally, Stefanie Thomas ’05 and Howard Liebman ’74 both came to the event from Brussels. Stefanie is head of strategy at Culture & Media Agency Europe, and Howard is a lawyer with the firm Jones Day. 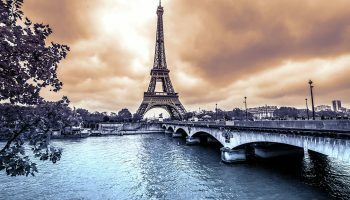 Both pledged to help organize future meetings with study groups visiting Paris. — Axel Krause ’56 has for decades been a contributing editor for the online TransAtlantic Magazine in Washington D.C., is the author of Inside the New Europe (HarperCollins), and is a governor of the Ditchley Foundation in the United Kingdom. He earned a master’s degree from Princeton’s Woodrow Wilson School of Public and International Affairs in 1958. Alumni had a blast at 21 club events held throughout the country on April’s Colgate Day. The next Colgate Day is July 13 — start planning now. Can’t make it to a club event? 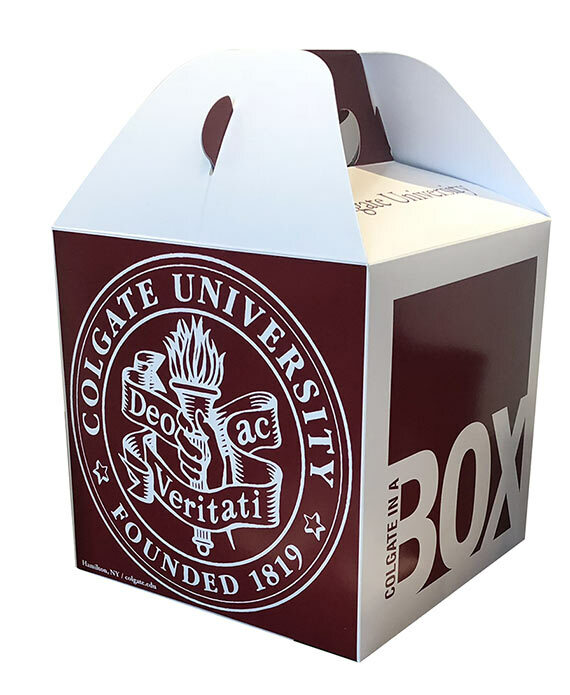 Host a Colgate Day house party with Colgate in a Box. 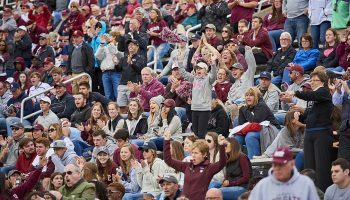 Just invite a group of Colgate friends or open up your home to other alumni in your area. When you register your house party and pay $13 for shipping, we’ll send you your Colgate in a Box, packed with spirit items to help you celebrate in style.